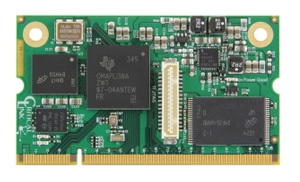 ARM9 – Advanced RISC (Reduced Instruction Set Computing) Machines – microcontrollers are high-performance, 32 bit RISC Core machines. They are extremely fast and powerful, with cores operating at speeds ranging from 150Mhz to 500Mhz. 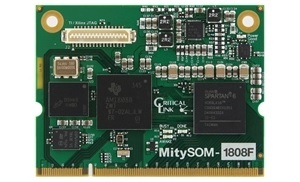 Critical Link offers several System on Modules (SOMs) that utilize ARM9 processors from TI: the MityDSP-L138 (OMAP), and the MitySOM-1808 (Sitara). In addition to ARM9 processors, the MityDSP-L138 also includes a DSP; all three of these modules offer an optional user programmable on-board FPGA as well. The ARM9 is a 32-bit CPU microprocessor that provides greater throughput, decreased cycle counts, significant optimizations, faster clock frequency, and decreased overall heat production when compared to earlier ARM processors. This is primarily achieved by the move to a more efficient architecture. This architecture allows for decreased load times, as well as a marked decrease in power consumption, factors contributing to a more cost effective CPU. ARM processors are used in many consumer electronics applications including mobile phones, game consoles, and cameras, as well as for industrial and scientific applications, where the ARM processor is used to implement rich user interfaces, and for overall system control.